Since its creation in March, the Miami-Dade County Aviation Department’s consulting business has been contacted by five foreign entities that have inquired about its services, the department said. The MIA Business Ventures Program – a consulting services corporation – was created so the Aviation Department, which manages Miami International Airport, can sell airport-related advice to raise money for Miami International’s operations. The program’s first job came in April, when it coordinated training in explosive detection practices for Port Au Prince’s Toussaint Louverture International Airport in Haiti in cooperation with the US State Department and the Miami-Dade Police Department. “We are exploring similar joint efforts in the Caribbean and Latin America,” said Aviation Department spokesman Greg Chin. MIA Business Ventures also was contacted recently by an entity seeking training and support for its bid to operate concessions at Chennai International Airport in India, which served more than 13 million passengers last year. Another inquiry came from a bidder for the concession contract at Barranquilla’s Ernesto Cortissoz International Airport in Colombia. If that bidder wins the contract, MIA Business Ventures would enter into an agreement with the company to provide it with technical advice as it develops concessions for the airport. A winning bidder is expected to be selected by year’s end, Mr. Chin said. Nor did the department provide how much revenue the corporation has taken in so far. However, officials have estimated it will generate an annual income of $300,000 to $500,000 during its first three years, and that is projected to grow to about $1.5 million by its fifth year. MIA Business Ventures was set up to provide airport consulting services to foreign and domestic airports or their contractors. The corporation is permitted to issue common stock in the name of Miami-Dade County, which owns the corporation. 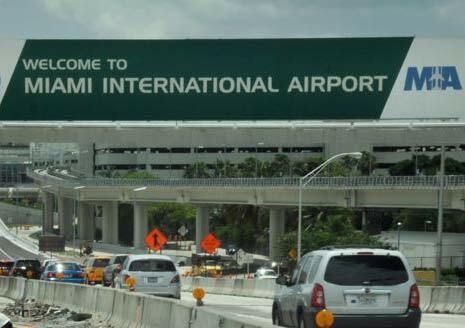 Miami International Airport “has a considerable and positive reputation worldwide for excellence in airport operations,” according to a county background statement. However, the county said, such requests for the Aviation Department’s advisory services have grown over the past few years and the department needs to find additional revenue sources, thus the creation of MIA Business Ventures. For Miami International “to be competitive, in addition to tightly controlling costs, it is crucial that [the department] grow non-aeronautical revenue [revenue derived from sources other than airlines] to substantially reduce the [cost] burden on the airlines,” the county said. In a typical transaction for MIA Business Ventures, the Aviation Department will receive an inquiry from an airport or airport contractor for assistance and forward the inquiry to the executives of the corporation, who will negotiate an agreement with the requesting party. The agreement will require the party to pay the corporation a consulting fee and reimburse it for the cost of Aviation Department staffers assigned to the project, including travel and other expenses. In some cases, the corporation also will request a percentage of the gross revenues of a particular airport function on which it provides consulting services. For a larger project involving MIA Business Ventures, the Aviation Department may need to retain subcontractors to assist with the project, drawing from a county-approved prequalified pool of contractors. MIA Business Ventures was to be overseen by a three-member board of directors appointed by the county aviation director, the mayor or his designee, and the chairman of the county commission. The board members were required to have at least five years of experience in senior airport management or airport development. The mayor or his designee also was permitted to staff the corporation with Aviation Department employees from time to time. However, no department employees or other county staff members assigned to assist the corporation were permitted to receive compensation for their services other than their regular county pay. The county was to allocate up to $30,000 to MIA Business Ventures to pay for state fees to create the corporation, to print business cards and stationery, and other initial business expenses. “Expenses of the corporation’s activities will be minimal as Miami-Dade Aviation Department employees will perform services from their existing offices and will receive no compensation beyond their current salary,” according to a county statement. In addition, MIA Business Ventures was to provide county commissioners with an annual report on the corporation’s activities, an income statement and balance sheet, as well as confirmation that it was subject to review by the Inspector General.